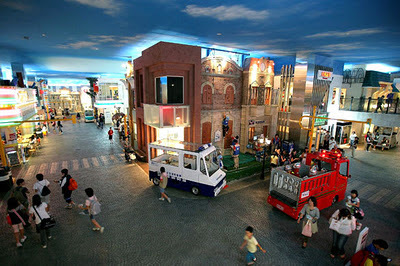 KidZania Kuala Lumpur at The Curve in Petaling Jaya is set to open by January 2012. Known as an Educational Theme Park for Kids, this 80000 square feet theme park will be the talk of town and the place to bring your kids for an adventure of a lifetime. The award winning indoor park is also very popular in cities like Tokyo and Jakarta besides its home country in Mexico where the first KidZania Theme Park was started back in 1999. Kids will actually play in a replica of a real city in here, complete with shops, streets and buildings which are made and run by children. This will be the ultimate City for Kids. Kidzania KL or Kuala Lumpur as it will be branded will also be located on the 6th and 7th floors of a seven-storey mall called Curve NX, located at the junction corner of the Curve, Ikea and Tesco. For the locals, it was where the former McDonald's building used to be. It will also be connected to the Curve Shopping Mall via a Sky Bridge. The massive project is also jointly developed by Khazanah and Boustead Group of Malaysia where a total of RM50 million was invested. They expect the theme park to have 500,000 visitors annually. Seems like all the other outlets around the world have an aeroplane sticking out of the building or located somewhere in the premises. For the Kuala Lumpur outlet, there is an AirAsia Airbus Plane sticking out of the building which you simply cannot miss. Where is KidZania in Malaysia? 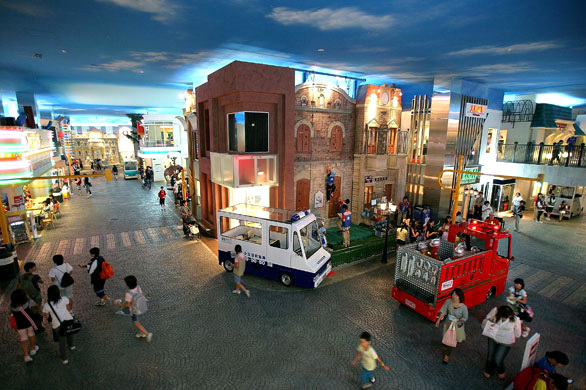 KidZania is located by the Curve Shopping Mall and Ikea in Mutiara Damansara. It is located in the new Shopping Mall called The Curve NX. This was the former 24 hours Mc Donald's Building at the junction of the Curve, Tesco and Ikea. It is also connected by a SkyBridge to the Curve Shopping Mall. Children aged 3 to 14 years old. Plans to include a spa or a reading corner where parents or chaperons can unwind while waiting for the children. At the moment, the entrance fees/ticket prices are not confirmed 100% but on a last report, the fee was said to be set at RM50.00 per child per entry. However judging from the counterpart in KidZania Jakarta, prices there are around US$12-US$13 (RM36-RM39) for kids, while accompanying adults pay a lower price of about US$9 (RM27). Once the entrance fees are announced, we will update it here. Children can take part in 60 activities over five hours. It will be a one time payment which include the price of other activities.